Leo van den Bergh; sale, Graupe & Mak van Waay, Amsterdam, 5-6 November 1935, no. 25 (fl. 1450). S. Slive, Jacob van Ruisdael, 2001, p. 50, no. 34b, illustrated. Berlin, 1925, no. 333, as Jacob van Ruisdael. 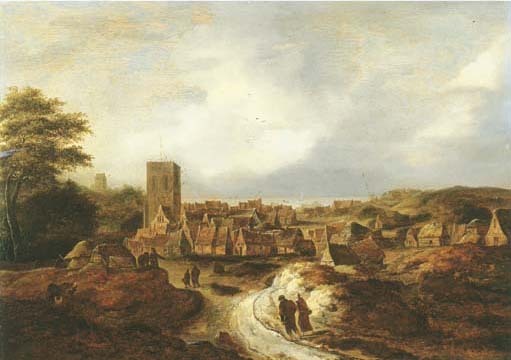 Views of the village of Egmond aan Zee, its cottages grouped around the ruined church tower, are to be found in the oeuvres of most of the prominent Haarlem painters. Salomon van Ruysdael and Jacob van Ruisdael both painted the village at least four times (see W. Stechow, Salomon van Ruysdael, 1975, p. 73, no. 31, pp. 109-10, nos. 268-9 and 279, and S. Slive, op. cit., pp. 48-50, nos. 31-4, illustrated). In addition, two paintings formerly attributed to Jacob van Ruisdael, but nowadays considered to be by his father, Isaack van Ruisdael, are known (see J. Giltay, 'The Problem of Isaack van Ruisdael 1599-1677', The Burlington Magazine, March 1992, CXXXIV, no. 1068, pp. 180-2, figs. 33-4). The present lot is described by Slive as "anonymous", while J. Giltay suggested an attribution to Guillaume Dubois (oral information on the basis of inspection of the original, 13 March 2002). M. de Kinkelder kindly informed us on the basis of a photograph that she believes the present lot comes close in style to the works by Claes Molenaer, for instance a painting in a private collection, Germany recorded by Slive (op. cit., p. 50, fig. 34a). Please note that the estimate should read 14.000 - 22.000 EUR.